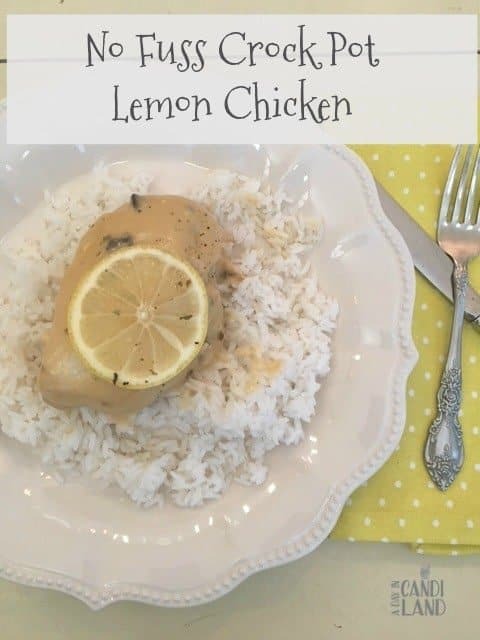 Serve 5 Ingredient Crockpot Lemon Chicken tonight for an easy meal for your family. 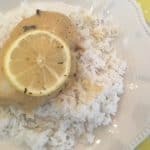 Make a simple but delicious dinner tonight with this 5 ingredients Crockpot Lemon Chicken recipe. This easy simple ingredient chicken crockpot recipe will come together in a snap and it has lots of flavors your busy family will enjoy. If you want more easy Crockpot Meals, try some of these delicious dishes. For some reason, it seems like it is 4:00 pm more often than once a day. I can meal plan and have my lists and know what I am making, but yet, sometimes I wish dinner would just make itself without me. I usually get home at 3:45 pm after being out during the day and then picking up my daughter from school. I run in and rest for a few minutes and then it is time to get dinner started. I am tired. Do you ever feel like this? I don’t know which one seems more unending, laundry or dinner? But as much as I love cooking for my family and having a clean house, I realized that you should be training your kids from day one to clean, cook and do laundry. Don’t get me wrong, I don’t do everything for my kids, but we have a big household, and we are a big family and it sometimes seemed easier doing it myself. Now my kids all do their laundry, they help with grocery shopping and even cook for themselves some days. Crockpot meals save a lot of time in the kitchen. You need to make sure if you are gone all day that the crockpot is actually turned on before you leave and turned on LOW. If you can’t smell it when you walk in the door in the afternoon than you will be going out to dinner instead. Something is WRONG!!!! If you eat late, then it might be better to start the crock pot at 3:00 pm or 4:00 pm and put the crockpot on high. I like to cook mine on low so I start about 10:00 am. I am home mornings and then leave for about 6 hours. We eat between 6:30 pm and 7:00 pm. So when you have the crock pot on low or have a warming feature, you can leave it for another hour if you need to. I want to challenge you to get your crockpot out of hiding and make a meal in the next few days. I have a few crockpot recipes you can try. Or if lemon is your go-to ingredient try these other recipes. I started using crock pot liners after I made this meal and would highly suggest you get them. It makes clean up so much easier, especially if you make something that sticks to the sides of the crockpot. 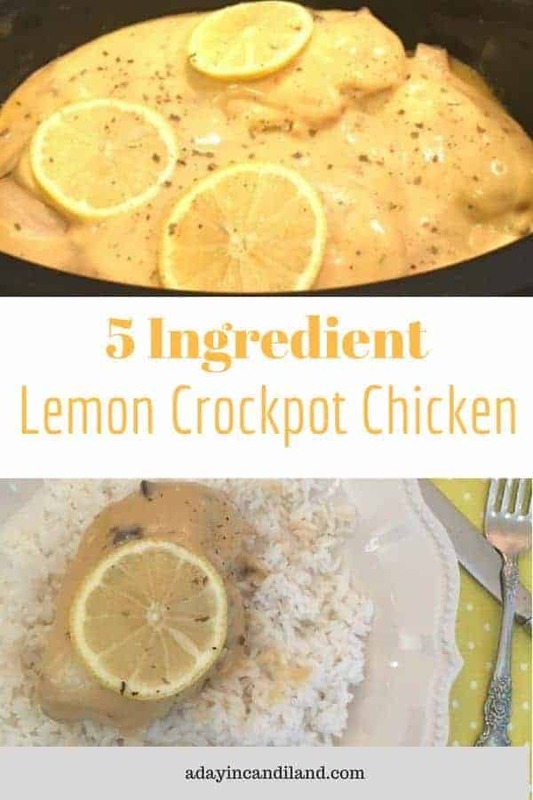 This 5 Ingredient Lemon Crock Pot Chicken does all the work for you. Make an elegant dinner with no fuss. I got high praise from my Mother in law when we had dinner that evening and everyone ate it all. This recipe is for 4 people, but I added more chicken to feed the 6 of us. Leave me a rating and let me know how you like it. I also cut up a sliced lemon for garnish. This is so simple since you only need 5 ingredients besides the rice which is the side. You can serve this with a salad also or some fresh veggies. 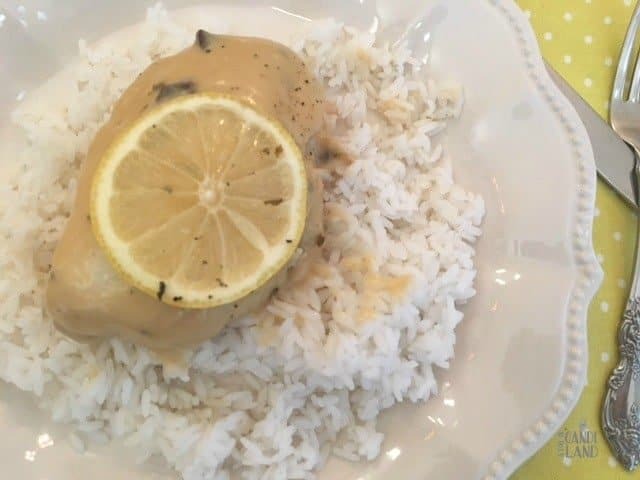 Enjoy this no-fuss 5 ingredients crockpot lemon chicken. Pin to your Favorite Recipe Board. If you love this lemon recipe leave me a 5-star review in the comments.